In this, the final essay in the Spaces of Leisure series, we shall move through the difficulty and strife of the 1990s, and into the contemporary urban and semi-urban spaces of today’s North Korea. We will see many threads and themes from earlier, more urgent days. Yet, this essay will also examine other, unexpected manifestations of physical culture, those marked out by their playful nature and co-option amid North Korea’s apparently austere past and political forms. I will examine the development of these “spaces of leisure,” which can be seen as new expressions of physical endeavor and entertainment, and consider the varied philosophical feedback loops between social and cultural practice in these terrains. In so doing, we shall tread a new analytical path through the maintenance of political norms and ideological framework in North Korea, a place that is rarely considered capable of ephemera or jocularity. 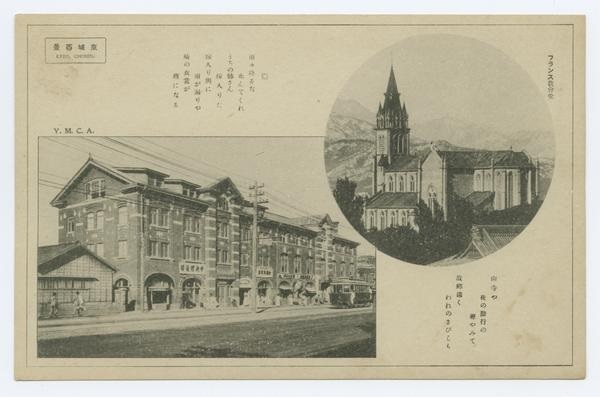 My first essay located the geographic and spatial birth of sporting leisure in the YMCA offices in Keijo (Seoul) during the Japanese colonial period. However, to move into the current period, we must seek connected terrain elsewhere. Social and personal practices we would now categorize as frivolous and/or ephemeral–essentially those of a physical nature that do not have self-improvement or betterment as their ultimate goal–demand more than geographic terrain and space. Temporality is also key to the manifestation of such “practices of leisure.” In order to investigate further, we need to begin not in Pyongyang’s wide avenues, but in the dense transportation corridors of Great Britain. Making the Trains Run on Time: Walking for Fun | Plenty has been written on the impact of railway timetabling on notions of “customary time” in the United Kingdom. The requirements of industrial modernity demanded that clocks should read the same time at all stations in all towns. This sounded the death knell for seasonal, cyclical time, and popular connections to primitive forms of social and economic being, but at the same time provided a spur to the development and consolidation of leisure and consumption as a socio-economic repertoire of practices. This new capitalistic, linear timeframe was deployed to support the development of working and industrial environments, but could equally be deployed to support the partitioning of time for activities not connected to work. The first manifestations of this included peculiar logistical festivals in the north of England known as “wake weeks,” where the entire populations of newly industrializing towns would be given a fixed week off and decamp en-masse to a particular seaside resort like Whitby or Brighton. Such activities thus supported leisure and, at the same time, the repair and maintenance of factory equipment while the workers were not at their machines. Similarly, “promenading,” or walking for a leisurely purpose, has a much longer history rooted in the development of formal gardens and parks in 17th-18th century Britain and their use by aristocrats for politics, diplomacy, or simply wooing. But in the 19th century, as working and life time became linear rather than cyclical, partitioned into working week/non-working weekend, promenading entered the repertoire of leisurely possibilities by which to fill non-productive periods within capitalistic, consumptive temporality. 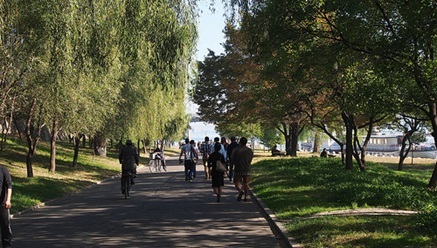 In Britain, Europe, and the United States, natural spaces were harnessed as the spatial terrain in which promenading, perambulating and picnicking could be performed. Rivers such as the Thames, the Seine, and the Neva were reconfigured, their banks and flows directly reconstructed and re-conceptualized. New and rebuilt parklands were not spaces within which aristocrats could shoot deer and game, as Richmond Park and the ancient Royal Forests had been; rather, they were artificial social landscapes of intriguing topography for the performance of promenade and perambulation. Small-p, Big-P: Promenade, Perambulate, Picnic, Politics | By embedding productive socioeconomic mores and temporality, these spaces were inherently “small-p “political, but were also co-opted at times to become assertively Political. North Korea, in common with many of the countries of the former Soviet sphere, still makes extensive use of concrete forms of military and political parading. It has become commonplace to witness North Korea placing its military hardware, infrastructure and personnel on show for annual celebrations in which political, ideological, and state power are theatrically paraded across specially built squares for charismatic effect. In these grand militaristic events and in trips to centers of ideological meaning outside of the capitol, the population are not merely spectators; they are encouraged to perform within politically imagined topographic spaces in acts of charismatic and ideologic tourism. 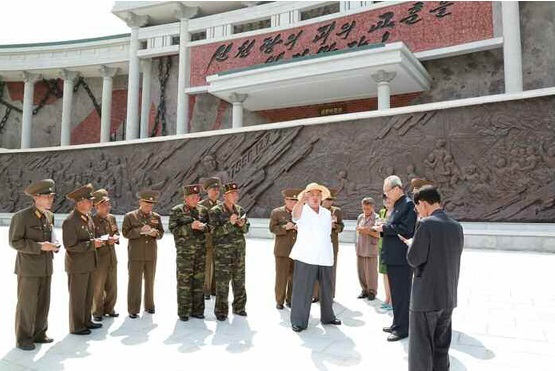 Visits to the revolutionary spaces of Baekdu and the Revolutionary Martyrs Cemetery, as well as connecting weddings and the broader social repertoire directly to political monuments, all therefore serve to co-opt, coral and co-create leisure and non-productive time, energy and opportunity within the structures and landscapes of political charisma. The rivers and riverbanks of Pyongyang have long been part of the political narrative. For instance, the Potong River Improvement Project of 1946 was “ground zero” for post-liberation hydrological development. Once neglected, the Taedong River has also been reconfigured by Benjamin Joinau’s charismatic axes of power and architecture into a participant in the topographic theatrics of modern Pyongyang. The river connects the demonstration space of Kim Il-sung Square to the ideological monolith of the Juche tower. 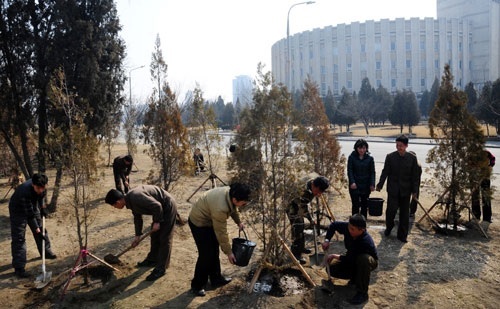 Beyond asserting the requirement that the citizenry perform theatrical supplication to Kimism, recent years have seen alternate forms of occupation and activity on the banks of the Taedong. By the turn of the millennium, North Korean reportage on the topography of the Taedong only paid momentary homage to the infrastructural events of 1946, instead noting that: “Many people of all ages and both sexes are having a pleasant time on promenades and parks.” This is an urban topography that would have been unfamiliar to the urgent revolutionary narratives of previous years; a topography of pleasure rather than conflict. While the river bank still saw vestiges of contest, such as the hulk of the USS Pueblo and its commemoration of American subjugation and defeat, pleasure rather than violence would seemingly be key to Pyongyang’s urban planning in the contemporary era. It is unclear if changes to urban planning, design and amenity in the North Korean institutional mind were accompanied by changes in Pyongyang’s philosophical approach to the delicate relationship between various modes of human existence; whether leisure had become a key goal of the nascent Songun politics. Just as in previous manifestations, North Korea’s ideological structure is light on conventional theoretical principles, but extremely dense and demonstrative in practical terms. Urban planning and the embedding of leisure practices in the socio-political everyday seemed to support the restructuring of goals within the Pyongyang elite. The era of creating “a strong and prosperous nation” towards the end of Kim Jong-il’s reign, in particular, matched political and developmental goals to an expansion of leisure activity and space. In ideological terms, the transfer of power to Kim Jong-un has made little difference to the country’s core political philosophical and military strategies. The Byungjin line’s combination of a long held aspiration to “scientificization” (a term often employed by the North Koreans) and technological-rationalist approach with an urgent commitment to nuclear capability, though dramatic in its impact on North Korea’s geo-political situation, has not stemmed the flow of changes in socio-spatial relations. Socially Acceptable Leisure: A Revolution in Socialist Modernity | Sino-NK has covered developments at sites such as Masik Pass, which appear to harness older themes of physically grounded leisure practice to a developmental repertoire, at least in Masik’s case serving the leisure life and times of others, a touristic form. While these of course do contribute to my conception of leisure and consumptive spaces (especially true in the case of the Mirim Riding Club), it is clear that within the sites and spaces of Rungra and the banks of the Taedong River, leisure praxis and practices of consumption appear to have become both practically embedded within North Korean developmental repertoires–inasmuch as they have become socially and culturally acceptable. 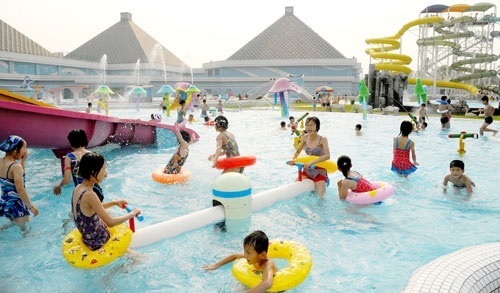 While previously it would have been possible to assert that these spaces were spaces of elite peculiarity and exceptionalism, resident only in Pyongyang, Rodong Sinmun recently announced the construction of a 45,000 meters squared waterpark in Hamheung, South Hamgyong Province, perhaps evidencing the spread of such spaces into the provinces of North Korea. 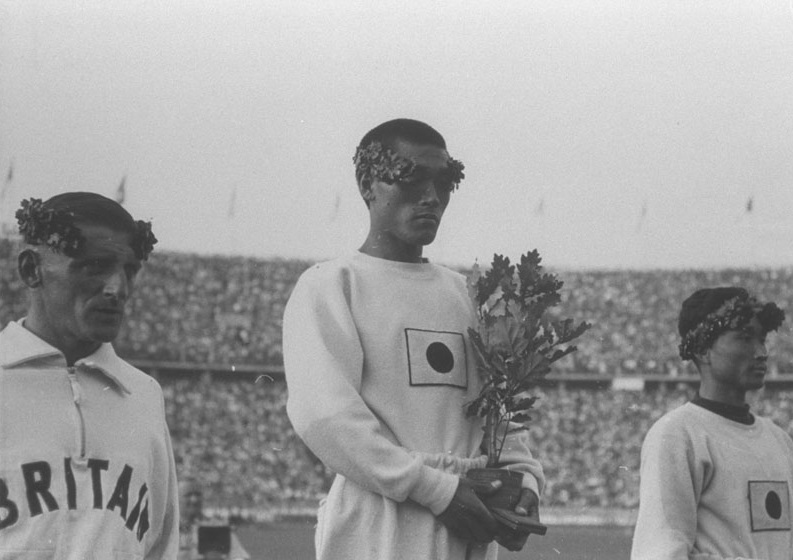 The space, practice and socio-political manifestation of leisure, entertainment and consumption has of course come an enormously long way from Son Ki-jong and his sporting endeavour during the Japanese colonial period. Social and political relations in the North Korean institutional and ideological mind have equally come some distance from their initial assertion and desire to embed and bestow conceptions of “authentic,” raw socialist modernity on socio-cultural praxis. Ridding social relations of frivolous intent, frippery and ephemeral practice is no longer a key goal of Kimism or any of Pyongyang’s ideologic forms. Hints abound of disconnections between previous modalities of social practice and relation in the field of leisure, disconnections which might one day feed back into the wider praxis of politics. 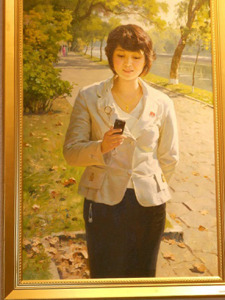 A painted young woman with a fashionable haircut and Kim badge, smiling privately at the text message on her Koryolink mobile phone in the park, young lovers holding hands on the Taedong promenade, children splashing wildly in Munsu or Rungra Water Parks, all with a sense of the leisurely informality that surely cannot be reconfigured into the rigor of the ideologically austere. As asserted in the first essay in this series, I identified the pre-history of Korean leisure as having revolved around physicality and sport. Colonial Chosen’s engagement with the wider world of sports and sporting competition, as at the 1936 Olympics in Berlin, might be conceptualized as the route through which modernist visions of entertainment or frivolity entered the Korean peninsula. David Rowe asserts that “sport in modernity is conventionally written as a process of cultural diffusion…with rationalized and regulated physical play either directly exported as part of the apparatus of imperialism and/or absorbed through the unfolding process of (post)colonialism,” a notion that lays the ground for conceiving of sporting leisure as one of the fruits of the colonial period. However as the reader will be aware, while the physical pursuits may well have been modernity’s category wedge opening for citizens of Chosen (or, later, of both Koreas), it was not where the essay found leisure and leisure activities in the early years of North Korea. Writers and artists engaged in such fields as literature, the cinema, music and dance have a very great part to play in inspiring people with revolutionary spirit… our literature and art should serve not only socialist construction in the north, but also the struggle of the whole Korean people for the south Korean revolution and the unification of the fatherland. This mobility and flexibility of form of course supports the co-option by Party and ideological interests of the more liminal and diffuse artistic or leisure forms of the cinematic. In part perhaps this explains Kim Jong-il’s later near obsession with film production  and the occasional harnessing of wider national strategies towards the generation of greater, more artistic, more impactful, cinematic production. While cinematic production and the viability of North Korean filmic output continued to be vital and key to Pyongyang’s leisure strategies during the remainder of the 1960s, it is interesting to note how Kim Il-sung offered such little commitment to the generation of built leisure environments centered around film. Of course, as I have asserted in the previous paragraph, this is part of the point. Kim Il-sung’s focus on musical and cinematic primacy so far as the consumable output of North Korea’s socio-cultural production leaves little physical trace, requires little tangible investment outside of its own production and can be utilized in as flexible a form as politics, ideology and situation demand. In another sense there is little sense of the development of physical spaces for leisurely interaction, nor leisure spaces disconnected from the realm of ideological or political appropriateness. It is instead a return to the leisure past, to the modes of colonial or early modernity’s leisure production and interaction that would herald the arrival and generation of the impetus for un-imagined, real spaces of leisure and consumption in North Korea. Returning to Physical Culture | In a sense, Kim Il-sung’s landmark speech of the early 1970s “On Developing Physical Culture” identifies missed opportunities and pines for the lost, if acknowledged, past of colonial sporting prowess represented by Son Ki-jong and 1936. The speech also outlines a future institutional agenda and imperative that serves as the progenitor of future events, such as the World Table Tennis Championships (1979) and the 13th World Festival of Youth and Students (1989), both held in Pyongyang. In our conditions, we can develop physical culture on a mass basis without difficulty. In a capitalist society or in the south Korean society, only rich people can go in for sports for amusement, but under the socialists system in our country everyone is provided with conditions for taking part on physical culture. In short what Kim Il-sung here demands in 1972 is the creation of the first real sporting spaces and terrains in North Korea, the first directly focused geographical spaces of leisure. From this imperative will spring both some of the obnoxious, overbearing sporting infrastructure of modern Pyongyang (such as the 1st of May Stadium and the Yanggakdo Stadium) and more local, community based leisure architecture. North Korea’s sporting diplomacy of recent years (both focused on football and basketball), would be impossible but for the resultant infrastructure. And as for the less savory, assertive ethno-nationalism of strength, blood and power negotiated by B. R. Myers, it, too, can be drawn into this Kimist imperative to physical improvement. Of primary and concluding importance however for this essay series is the nature of infrastructural development unleashed by “On Developing Physical Culture.” Bridging the gap in developmental terms between the era in which North Korean landscapes were almost entirely regenerated to serve production capacity, generation or risk needs, such as those within early field of hydrological improvement (the Potong River Improvement project for example), and modern spaces of apparent frivolity and play (the afore-mentioned Munsu Water Park), it seems the connector from one era to the next. In the concluding essay to this series, I will examine this modern era of leisure and consumptive space in North Korea, considering whether finally the importance and primacy of the playful (if only for the Party and institutional elite) has begun to supplant the imperatives of ideology and politics in their creation. After all, it needs to be determined whether or not in 2014 we can truly see the birth of not only local and indigenous North Korean spaces of leisure, but also space for pure consumption and accumulation. Kim Il-sung, “On creating Revolutionary Literature and Art,” Works. Vol 18 (Pyongyang: Foreign Languages Publishing House, 1964), 389. David Rowe,“Sport and the Repudiation of the Global,” International Review of the Sociology of Sport 38, no. 3 (2003): 6. Kim Il-sung, “A Happy and Cheerful Life for the Working People,” Selected Works Vol 3 (Pyongyang: Foreign Languages Publishing House, 1961). Kim Il-sung, “On creating Revolutionary Literature and Art,” Works. Vol 18 (Pyongyang” Foreign Languages Publishing House, 1964), 381. Evgeny Dobrenko, The Political Economy of Socialist Realism (New Haven: Yale University Press, 2007). Ezra Vogel, “From Friendship to Comradeship: The Change in Personal Relationships in Communist China,” China Quarterly 46 (1964): 46. Thomas Clayton, “Building the New Cambodia: Educational Destruction and Construction under the Khmer Rouge, 1975-1979,” History of Education Quarterly 38, no. 1 (1988): 1-16. Kim Il-sung, “On creating Revolutionary Literature and Art,” Works. Vol 18 (Pyongyang: Foreign Languages Publishing House, 1964), 388. 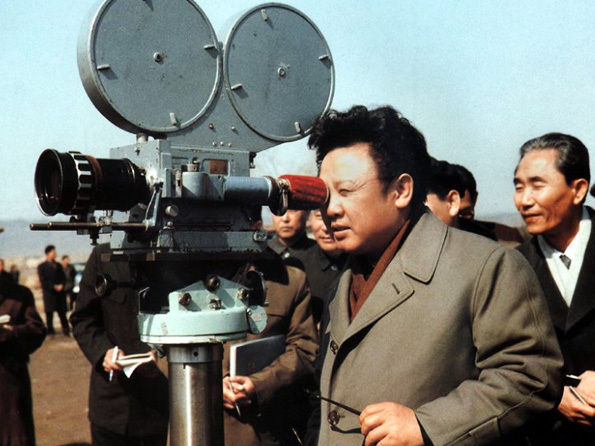 Kim Il-sung, “Let us Produce More Films Which are Profound and Rich in Content,” Works. Vol 20 (Pyongyang: Foreign Languages Publishing House, 1966), 232. Charles Armstrong, “The Origins of North Korean Cinema: Art and Propaganda in the Democratic People’s Republic,” Acta Koreana 5, no. 1 (2002): 1-19. Kim Suk-young, “‘Guests’ of the Dear Leader: Shin Sang-ok, Choi Eun-hee, and North Korea’s Cultural Crisis,” Joint US-Korea Academic Studies (2008). Kim Il-sung, “On Developing Physical Culture,” Works Vol 27 (Pyongyang: Foreign Languages Publishing House, 1972), 312. 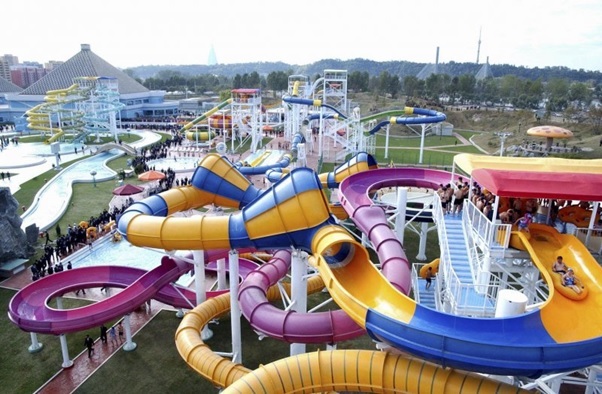 In recent years, the North Korea watcher or analyst has been continuously presented with a number of apparently humorous images of Pyongyang residents reveling in the delights of the Rugna Aquarium and Munsu Waterpark, grappling with the icy slopes of Masik Pass or engaging in equestrian delight at the Mirim Riding Club. 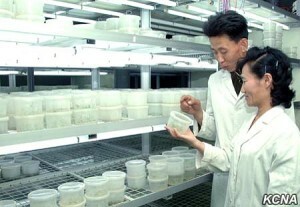 Excluding some nascent analysis of North Korea’s very own developing “fluorescent night-time economy” led by the Moranbong Band, these singular enterprises and pleasure terrains jar our conventional understanding of North Korea as a defiantly socialist, revolutionary, austere, anti-consumption entity. Might these instances actually represent the emergence of a new category of spatial and social relation in North Korea, serving as a harbinger of societal and social upheaval, auguring a reconfiguration that would render the bleak rigor of socialist modernity redundant? Alternatively, might these seemingly contradictory approaches to development signal a previously unseen (or un-theorised) maturity in North Korean political structures, manifesting an ability to co-opt even the most oppositional modes of social being within its socio-political framework? This series of essays, titled “Spaces of Leisure,” seeks to investigate the historical narratives of leisure and non-productive social spatiality in North Korea. I aim to consider and examine the nature of North Korea’s current form and typology and to suggest an analytical framework for its “emplacement” within contemporary North Korean charismatic political and social form. While this is essentially a formative exercise in what, it is hoped, will grow and evolve into a major stream of academic research with the potential to tie in various ephemeral (or even deviant) strands of investigation within North Korean studies, I hope by the final piece to have laid some analytic and investigative strands, enough at least to spark the reader’s imagination and present new conceptual possibilities. Leisure under the Colonial master | The title of this essay — A (Pre-) History of North Korean Leisure — naturally begs two questions of category and conception. The first is the meaning of leisure, which, as it is an academic discipline by itself (leisure studies), I will leave to one side. However, for the purposes of this essay, the secondary question — “When does this (pre-) History begin?” — is highly important to this essay and those that will follow. In financial terms the Japanese economist Mitsuhiko Kimura, in an act of fiduciary archaeology within his reconstruction of economic developments during Chosen’s colonial era, asserts an astonishing 5.37 percent annual increase in spending on the leisure services and the products of consumption (running ahead of general inflation for the period of an annual .97 percent). Early narratives of North Korean leisure | Along with redeveloped railway networks, bureaucratic universe, and a modern industrial infrastructure, the colonialist enemy bequeathed at least some development in the conception of leisure to the emergent institutions of Pyongyang’s sovereignty. 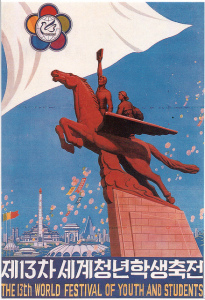 While North Korea’s early historical narrative does not seem to give much space nor time for activities conventionally understood as leisure, Kim Il-sung and the Korean Worker’s Party now in power following the collapse of Japanese authority and apparent Soviet favor found it necessary to address at least some of the elements necessary for the development of leisure time or consumptive space. It is necessary to preserve the fine features peculiar to our nation in all spheres of folk song, music, dance, etc., and at the same time, create new rhythms, new melodies and new rhythmic forms demanded by the new life and learn to put new content in the rich, varied, artistic forms possessed by our people. As a geographer of course the simple existence of the possibility of future cultural production directed at entertainment or leisure activity (no matter how political in form), is not enough for this author and for this series. Conceptual, theoretic, imagined space is no space at all if it does not occupy physical terrain. However, just as often in later governmental narratives from North Korea, the physical realization of Kim Il-sung or the structures of the central party committees would be the responsibility of more practical, more local institutions. While raising the people’s level of knowledge, the amateur circle activities in physical culture, dance, music should be developed… In this respect, the democratic publicity hall should play an important role as the centre of cultural life. Perhaps the veracity or reality of this narrative in which a wind and frost-beaten, exhausted Kim Il-sung and Kim Jong-suk might strike up the nights entertainment at their mountain camp or rural hamlet, instantly creating a space of revolutionarily minded leisure or entertainment is doubtful or a conceptual stretch? What is not difficult to conceive of in our era is the importance of cultural or leisure production and spatiality to North Korean narratives and Pyongyang’s sphere of governmentality. Producing a distinctly revolutionary or ideologically sound leisure or culturally productive space or spaces has become vitality important to these narratives and the performative element almost the focal point to the charismatic politics of contemporary Kimism. While such current performance spaces and productions will be the ultimate destination of this essay series, following review and uncovering of this genesis of revolutionary leisure and productive space in the village, family, or publicity hall, the following essay will review the development of entertaining or ephemeral spaces and places in North Korea from the era of the Sino-Soviet split to the collapse of the Warsaw Pact and the Soviet Union in 1991: a period in which the production of leisure and entertainment, its procedures, structures, and terrains were vital to North Korea’s navigation of the geo-political spaces of the mid-twentieth Century. Koen De Ceuster, “Wholesome Education and Sound Leisure: The YMCA Sports Programme in Colonial Korea,” European Journal of East Asian Studies 2, no. 1 (2003): 53-88. Kimura Mitsuhiko, “Standards of Living in Colonial Korea: Did the Masses Become Better or Worse Off Under Japanese Rule,” The Journal of Economic History 53, no. 3 (1993): 629-652. Kim Il-sung, On Some Questions of Our Literature and Art, Selected Works Vol. 1 (Pyongyang: Foreign Languages Publishing House, 1951), 305. 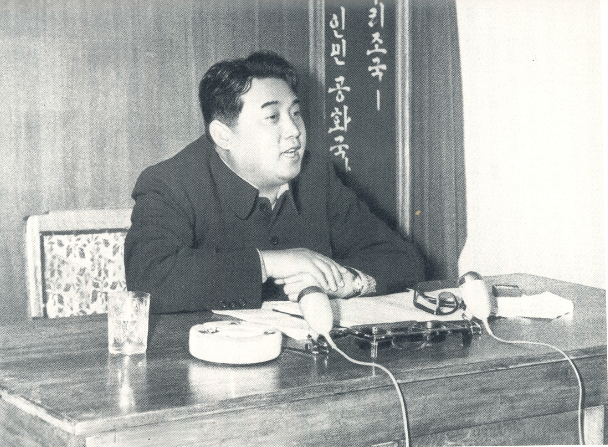 Kim Il-sung, On the Immediate Tasks of City and Country People’s Committees, Selected Works Vol. 2 (Pyongyang: Foreign Languages Publishing House, 1958), 183. Kim Il-sung, A Happy and Cheerful Life for the Working People, Selected Works Vol. 3 (Pyongyang: Foreign Languages Publishing House, 1961), 250. Kim Jong-suk, in response, appears to already consider the physicality of the recent past as a topography of difficulty for the guerrilla revolutionaries. It is a space which she sees as being ripe for transformation and future territorializations, deterritorializings, and charismatic theatric presentations. Bearing his teachings in mind, she looked back upon the road the Korean revolution had traversed to Mt. Paektu. It was indeed a course of a bloody struggle, which had to break through a forest of bayonets. 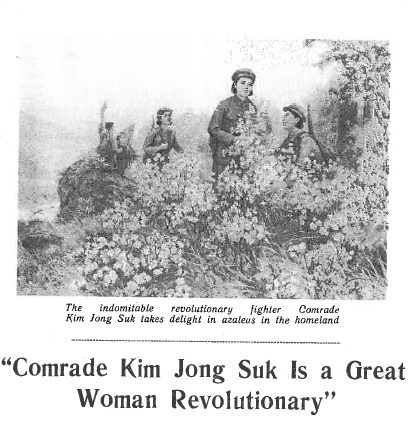 In-spite of this obvious lack of utility to a band of revolutionary guerrillas, Kim Jong-suk seems determined to nurse the inept soldier to usefulness: “Kim Jong-suk walked together with him on marches, to encourage him, and helped improve his marksmanship.” In addition to helping him learn to shoot straight, she also mended his clothes. Such maternal support is fundamental to the narrative of Baekdu, and of primarily importance to her contemporary transformation into a militaristic saint. 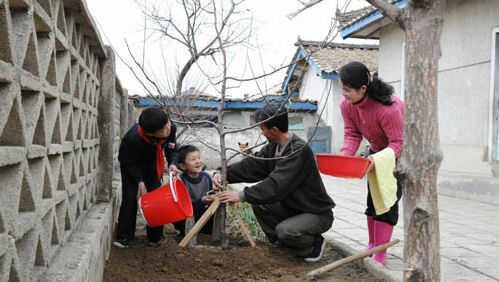 In engaging in pedagogical practice toward the unlikely young soldier, encouraging and teaching him to fight and providing him with a role model, Kim functions as father and mother. In this sense, she shows androgynous qualities of both female and male. Beyond the mountain but in similar topography, North Korea’s narratives recount an important event in March 1940. This moment is categorized in hagiographies of Kim Jong-suk as the moment of “becoming a human fortress and a shield,” echoing the status of Mt. Baekdu as a “natural fortress.” This is another vital moment in her semi-deification, without which moments of deterritorialization and reterritorialization would not be possible. Having, counter to conventional military strategy, attacked uphill and engaged Japanese forces high in the mountains, the guerrilla band was subject to a challenging counter attack. Kim Il-sung commanded the battle from a rock on the ridge of the mountain. 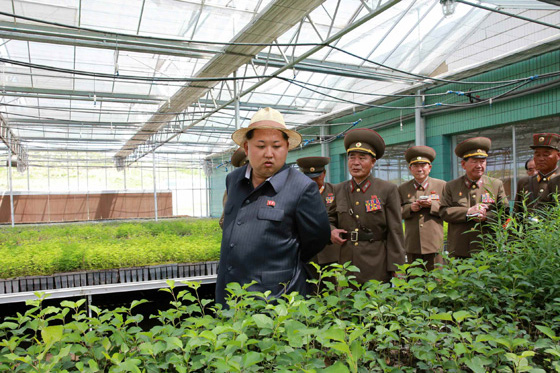 Mindful of his safety, Kim Jong-suk kept a close watch on the surroundings. 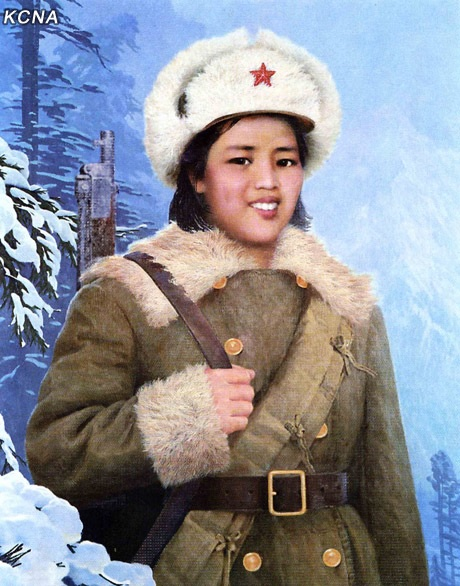 Noticing reeds swaying strangely, she turned her eyes and saw half a dozen enemy soldiers hiding in a reed field, taking aim at Kim Il-sung on the ridge… at the hair-raising moment, Kim Jong-suk raced to Kim Il-song, shouting “Comrade Commander!” and shielding him with her body. Then she pulled the trigger of her Mauser. The enemy soldier in the front fell down, dropping his gun. A gunshot followed. Kim Il-sung had shot over her shoulder. In this way they both shot all the enemy soldiers in the reed field dead…. North Korean soldiers living out Kim Jong-suk’s militant legacy. 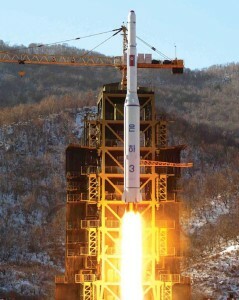 Via KCNA. Maternal Strength: Pedagogy and Violence | Kim Jong-suk’s selfless moment of sacrificial charismatic intent denotes a moral obligation towards the physical person of the leader, Kim Il-sung; one that goes beyond simple protection. Equally, it co-opts the difficult, fractious terrain of the mountainscape into the realm of Kim Jong-suk’s commitment and obligatory sensibility. North Korean landscapes in which these moral obligations were dramatically put into practice by Kim Jong-suk are now further marked by the institutional utilization of that drama and authority . 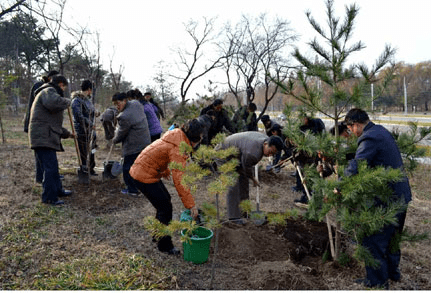 The ridge on which Kim Il-sung was nearly killed now forms part of an educational program for civil servants at Mt. Baekdu; these “study tours” of the revolutionary topography are meant to underpin their own ideological commitment. The birch trees at Lake Samji, under which the female guerrillas led by Kim Jong-suk rested, and under which the Kims’ relationship was abstractly confirmed and consummated, are now a site of revolutionary reflection and pilgrimage; a place of reterritorialization. 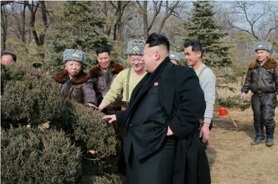 Leaning on a birch tree on which spring tints were emerging, he [Kim Il-sung] posed with the commanding officers…. One of them suggested to him that he should have his photo taken with Kim Jong-suk. Hearing this, Kim Jong-suk grew shy and hid behind the backs of the women guerrillas. They pushed her forward to his side. In order not to miss the moment, the “cameraman” clicked the shutter. For Kim Jong-suk, it was as good as a wedding photo…. One night while the battle was still raging, she [Kim Jong-suk] was climbing a mountain with a woman guerrilla carrying a jar of hot water for the combatants when she slipped on some ice and tumbled down a slope. The woman guerrilla hurried down, and found that though she had lost consciousness, she was holding the water jar tightly. Her affection for her revolutionary comrades and fighting spirit encouraged the guerrillas to endure cold and fatigue in the battle…. The Japanese aggressors ran amuck in an attempt to hamper the people’s support to the guerrilla army. The bestial aggressors recklessly arrested and slaughtered those people who purveyed provisions and commodities to the guerrilla army…. 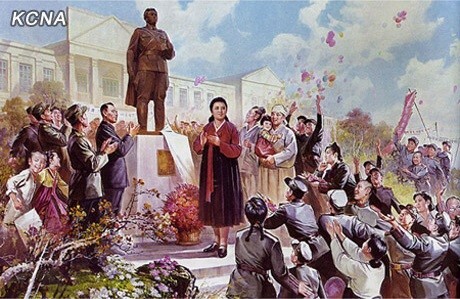 A recent artistic depiction of Kim Jong-suk’s post-liberation activities prior to her death include endorsement of Kim Il-sung statuary in Pyongyang. Image via Mansudae Arts Studio. While Kim Jong-suk survived this ordeal, the same could not be said for Chang Gil-bu, mother to a number of revolutionaries. Not only was Chang’s son Ma Dong-hui tortured so severely that he “bit off his own tongue” rather than reveal anything and was then killed “viciously in a police station;” also, her daughter and daughter in law, Ma Guk-hwa and Kim Yong-kum, both reportedly died “a heroic death in battle.” Chang is portrayed as also undergoing torture, wherein “clubs and leather whips struck her until she was badly smeared with blood.” Thus we can see that the action on the field of battle and violent deaths of some of the women following Kim Jong-suk are important elements in the story. A narrative element of their own, they are not just a supplement to bolster the fame of Kim Jong-suk. Kim’s apparently selfless actions in collaboration with the topography allow future generations to access the charisma of her militaristic, transcendental femininity. 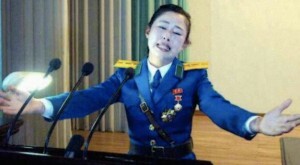 Within the narrative, Kim Jong-suk emerges as a demiurge, the text of her biography explicitly mentioning that she barely sleeps or eats; indeed, “many times she only had water for her meal.” Through her reported actions, Kim Jong-suk depersonalizes and de-materializes herself into the realm of the saintly, the mythic and the immortal. Kim Jong-suk: A Biography (Pyongyang: Foreign Languages Publishing House, 2002), 61. Heonik Kwon and Byung-Ho Chung, Beyond Charismatic Politics (Lanham, MD: Rowman and Littlefield, 2012). Kim Jong-suk: A Biography, 62. Brian Myers, The Cleanest Race: How North Koreans See Themselves and Why it Matters (New York City: Melville House, 2012), 48. Kim Il-Sung, Reminiscences With the Century, Vol. 3 (Pyongyang: Foreign Languages Publishing House, 1992). Kim Jong-suk: A Biography, 165. 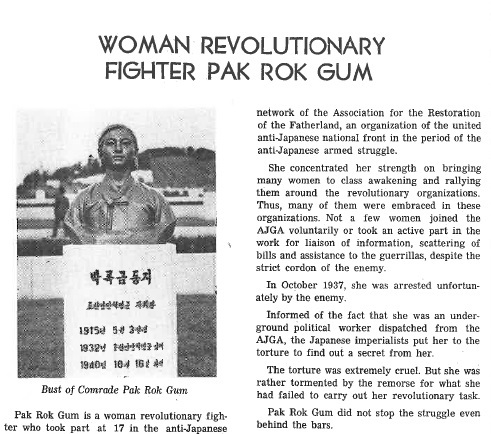 “Anti-Japanese Women’s Association and its Assistance to Guerrillas,” Women of Korea 91 no. 3 (1991). 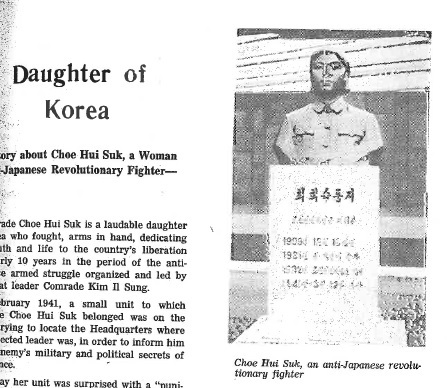 “In Memory of Comrade Kim Jŏng-suk,” Women of Korea 63 no. 3 (1974). 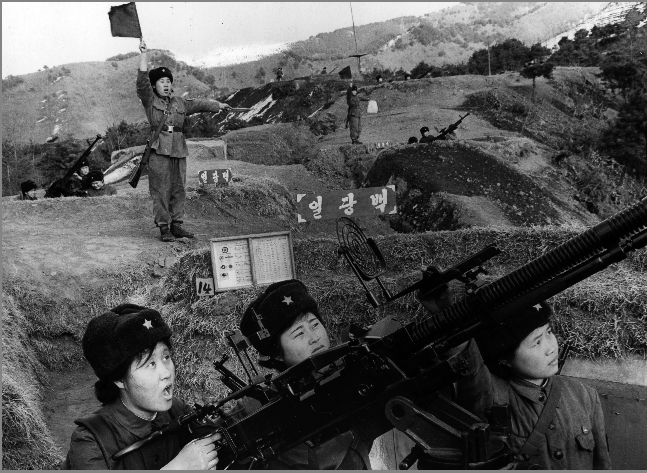 “You Must Follow the Leader with All Devotion,” Women of Korea, Vol. 63 no. 3 (1974). Kim Jong-suk: A Biography, 51.